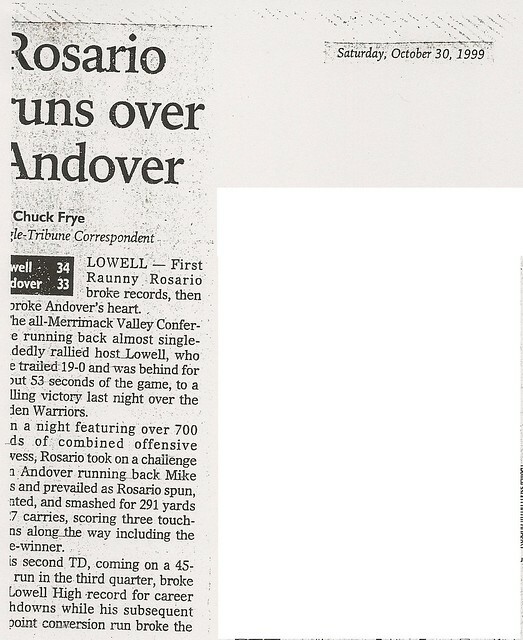 Refusing to be frustrated by the effects of a tragic childhood accident that caused him to lose the vision in his right eye, Raunny Rosario persevered and developed into one of the most prolific running backs in the long and storied history of the Lowell High School Football program, establishing a long and impressive list of school records along the way. 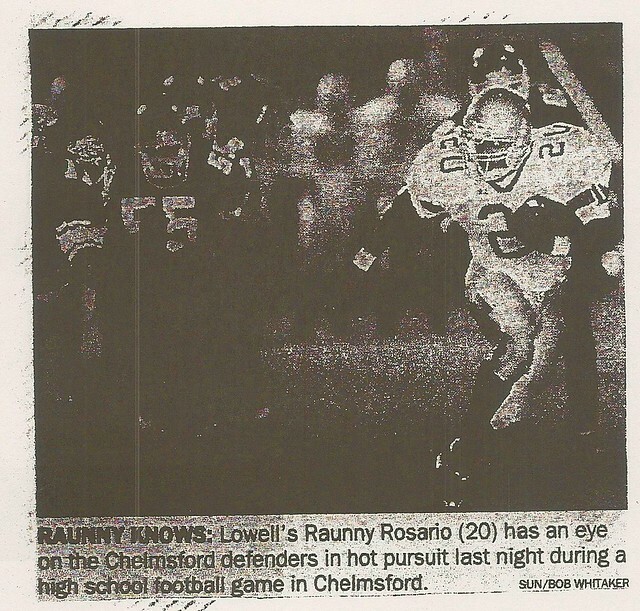 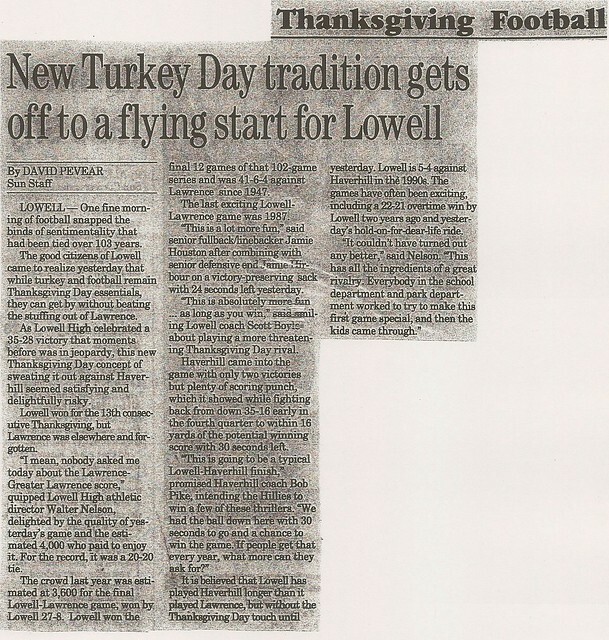 Playing his first significant varsity action against Billerica late in his sophomore season(1997), Raunny scored 3 touchdowns and rushed for 122 yards to lead Lowell to a 25-6 victory. 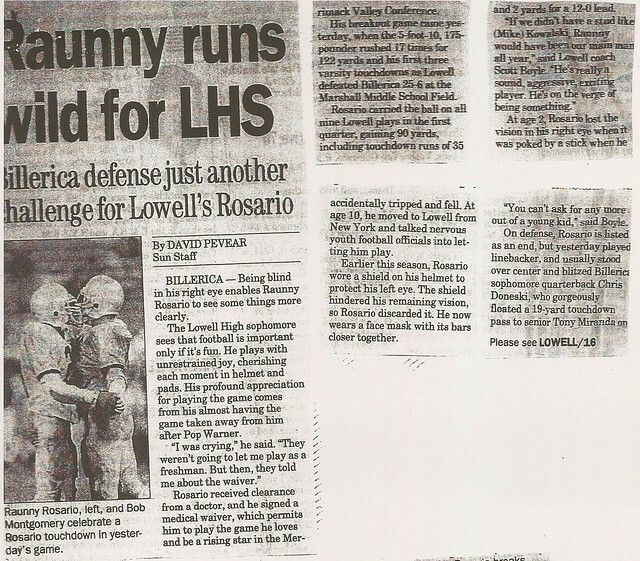 Raunny’s performance in that game was a harbinger of things to come. 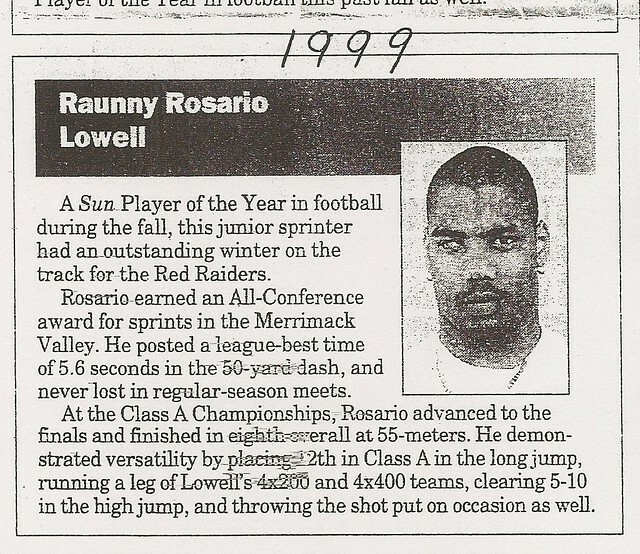 The promise that Raunny demonstrated in that Billerica contest came to fruition the following season (1998) as Raunny, now a junior, compiled arguably the greatest season by a running back in the 100-plus years of Lowell High School football. 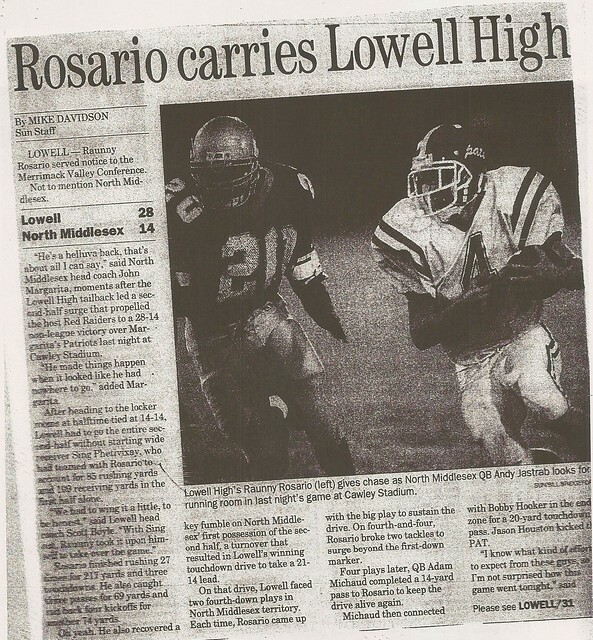 Carrying the ball a school record 255 times, Raunny set additional LHS one-season records of 1,752 yards rushing (6.9 yards per carry), 30 touchdowns, and 180 points as the Raiders won their final 8 games to finish 9-2. 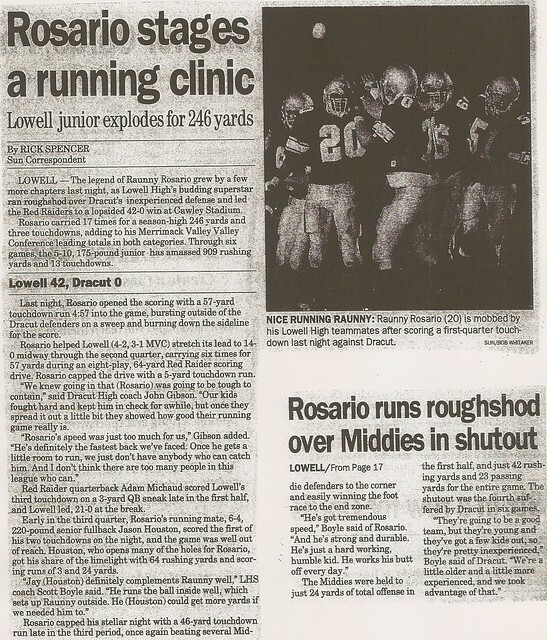 Among the highlights of Raunny’s phenomenal season were a 184-yd. 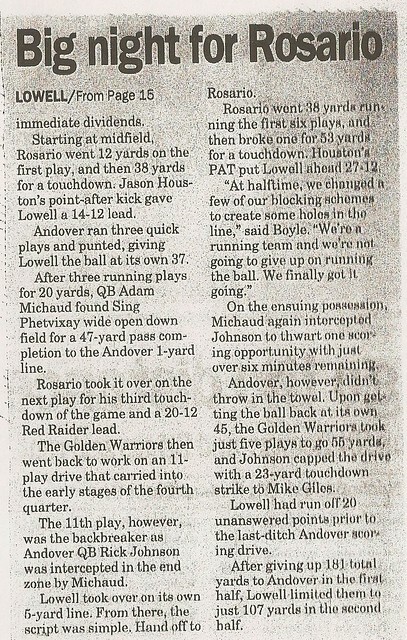 4-TD effort against Andover (27-18 victory) and a season-ending school record 336-yd. 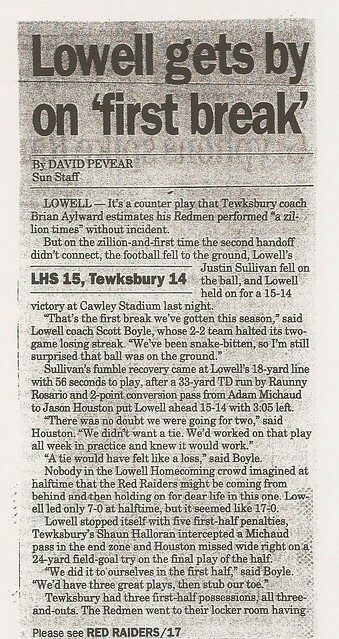 5-TD performance against Haverhill (35-28 win). 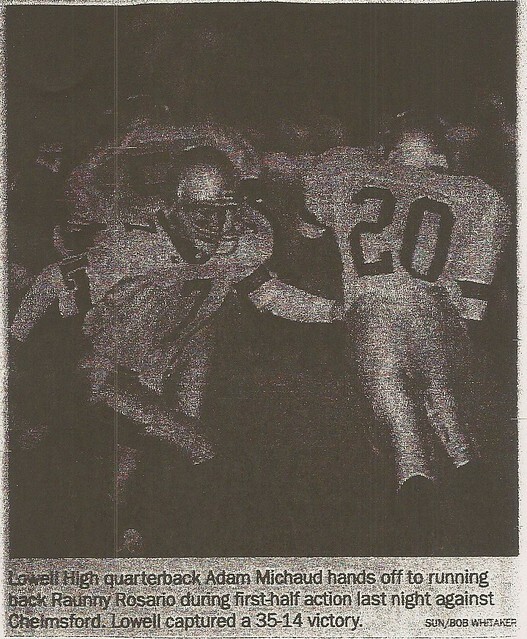 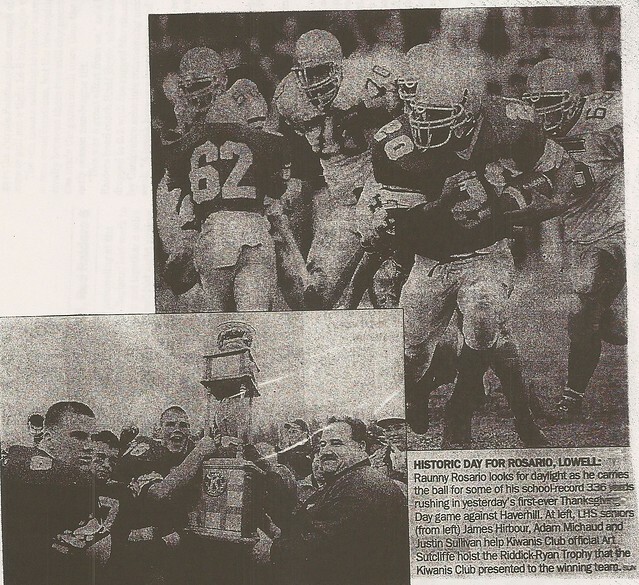 Raunny continued his assault on both opponents and the LHS Football Record Book during his senior season (1999). 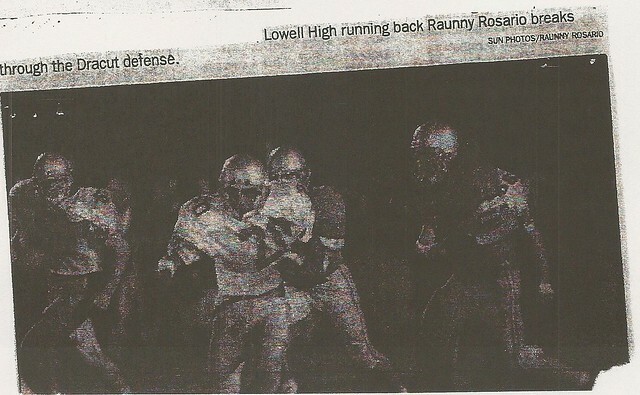 Despite missing the Haverhill game with an injury, Raunny still rushed for 1,018 yards and scored 17 touchdowns and 104 points. 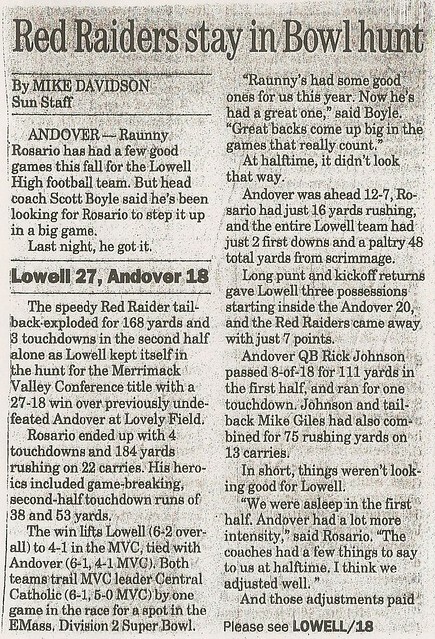 Raunny’s highlights included a 262-yd, school record 6-TD gem versus Dracut. 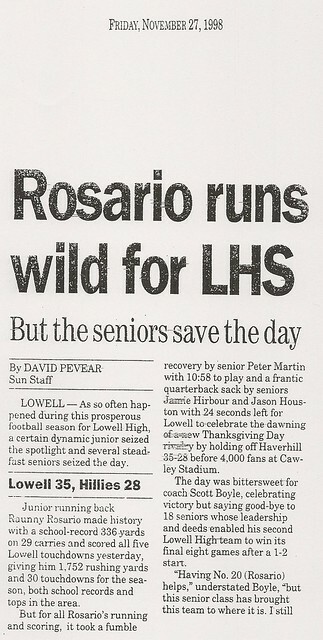 In perhaps the most spectacular performance of his career, the stellar running back carried 27 times for 293 yards and 3 second half TDs, the f1nal one with 53 seconds remaining in the contest to lift the Red and Gray from a 19-0 deficit to an incredible 34-33 victory over Andover. 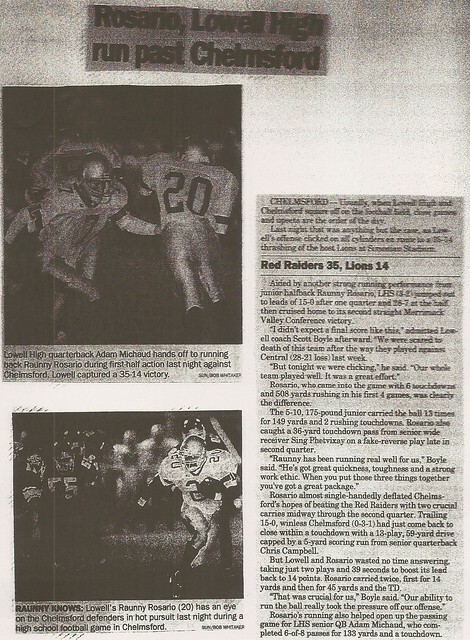 Raunny is at or near the top in every rushing and scoring category in the LHS Record Book. 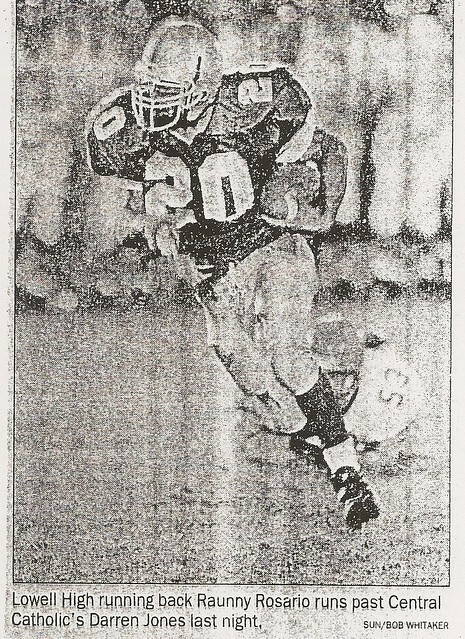 Additional entries include: 1st in career TDs (52) and career points (314) and 2nd in career carries (476) and career yards rushing (3,337). 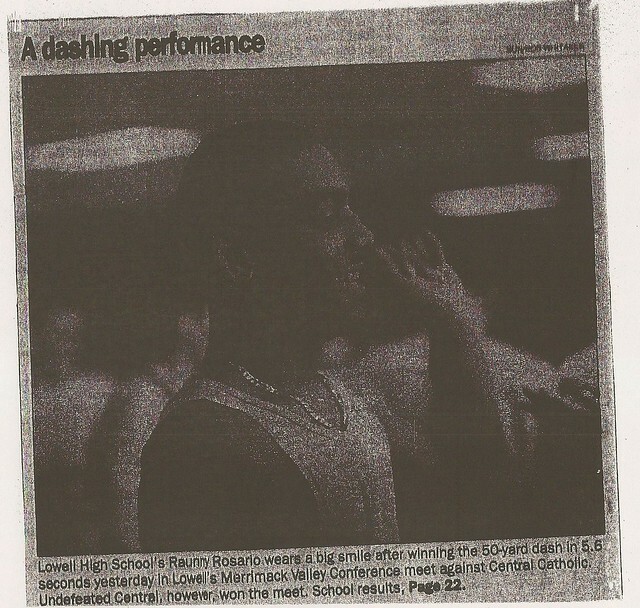 Raunny also competed on the LHS Indoor Track team as an elite sprinter. 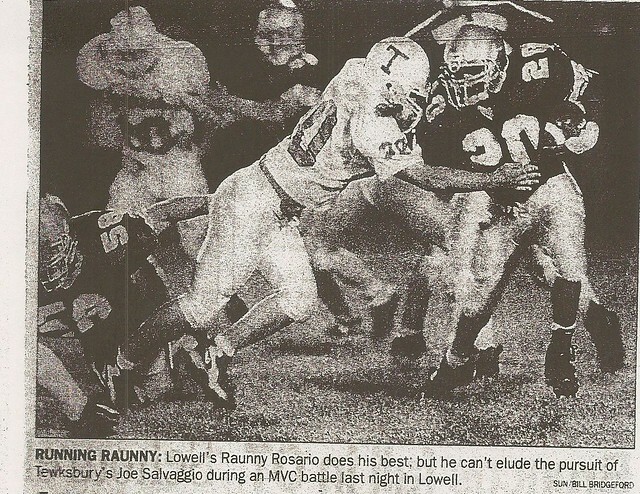 Undefeated in the MVC in both his sophomore (1996-97) and junior (1997-98) seasons, Raunny twice earned MVC All-Conference honors. 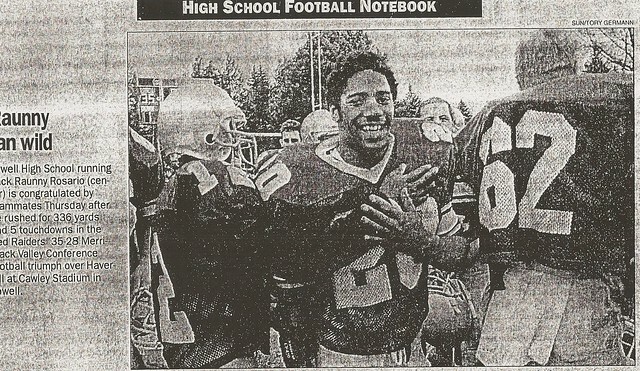 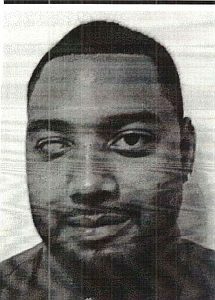 He placed 8th at the Massachusetts Class A Indoor Track Championships in 1998 and was a member of the Raiders’ 4 x 200 meter relay team that advanced to the Massachusetts All-State Championships. 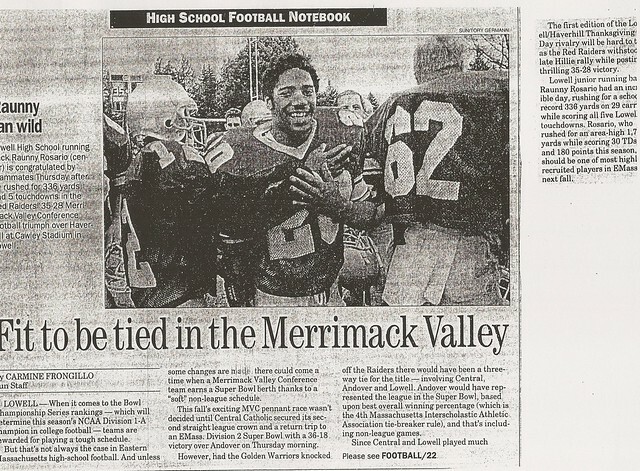 After graduation Raunny played football at UMass Amherst under Coach Mark Whipple. 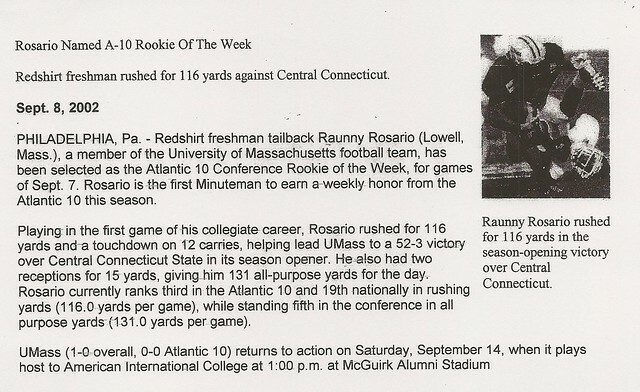 He earned Rookie of the Week honors for his 116-yd, 1-TD effort against Central Connecticut. 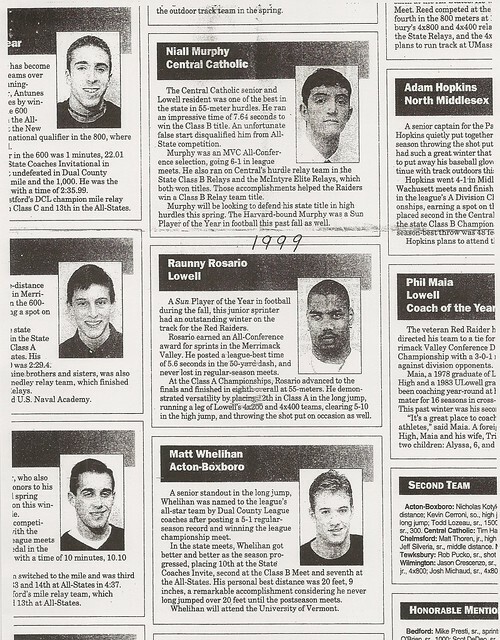 He received the Vic Fuscia Award as the Minutemen’s Most Improved Offensive Player at the conclusion of the 2002 season.